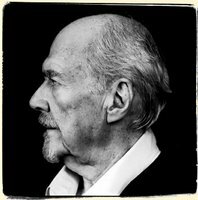 The Online Photographer: Altman R.I.P. Robert Altman died last night. He was one of the last of the true auteurs—the word referring to an artist who "authors" his films, creating them as if they were personal works of art. He directed as many flops as hits, if not more, but even some of his truly obscure films remain more worthy than a lot of ordinary, "successful" Hollywood fare. He had his first commercial success with the anti-war film MASH, which was really about Viet Nam—although the book that inspired it and the TV sitcom that it inspired were both clearly set in the Korean war, nowhere in the movie does it mention which war it is, and Altman says it was the studio that made him put a disclaimer at the beginning establishing the setting as the Korean war. It remains a strange, opaque experimental film, the first film to incorporate what would later become the hard-drinking Altman's hallmarks—improvisation by the actors, overlapping dialogue, long, shambling tracking shots, and lots of loose ends and discontinuity. "Our mandate was bad taste," Altman said of MASH. "If anybody had a joke in the worst taste, it had a better chance of getting into the film, because nothing was in worse taste than that war itself." Everyone has their own favorite Altman film. Mine is the brilliant, beautifully dark anti-western "McCabe and Mrs. Miller," starring Warren Beatty and Julie Christie as doomed lovers in a raw frontier town whose triumphs are emotionally gripping but decidedly Pyrrhic. (With cinematography by Vilmos Zsigmond and music by Leonard Cohen. 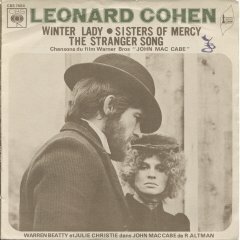 Pictured here are Beatty and Christie on the cover of Cohen's 7" single of songs from the film.) I'd personally nominate the farcical musical "Popeye" with Robin Williams, from 1980, as his worst, though that's of no account. Bob Altman was also a rare bird in that he was a film director who was forthrightly anti-Hollywood—not an easy role to play even in the '60s and '70s, much less today. He was hugely popular with actors, who he both admired and trusted—his film "The Player," about the movie industry, from the early '90s, features walk-on and cameo appearances by a staggering number of famous actors, actresses, and other celebrities (it also contains what is supposedly one of the longest opening shots in film history). He even blamed Hollywood for 9/11, saying that Hollywood action-adventure films virtually serve as training films for terrorist acts, or at least as their inspiration. "Nobody would have thought to commit an atrocity like that unless they'd seen it in a movie," he said. Like both Alfred Hitchcock and Martin Scorcese, Altman received five Oscar nominations for Best Director but never won (he was given an honorary Oscar last year, easily the high point of the ceremonies). His most recent success was "Gosford Park" from 2000, and he worked right up until the end—his last film was the recently released "Prairie Home Companion," and he was scheduled to start shooting his next one in February. Robert Altman was 81. The picture at the upper right is "Robert Altman, London, 1993" by Steve Pyke (used with permission). Steve tells me his favorite Altman film is "California Split." Who shot the Altman portrait? I've looked for it till I'm bleary-eyed and still don't know. I haven't given up, though, and I'll post it if I find out. I think you'll find that the longest tracking shot (actually Steadicam shot) is "Russian Ark". The entire film is a single take. Ah, another McCabe and Mrs. Miller fan. I rank it right up there among the finest films ever made. It's one of the few great films that holds up so well over the decades. I was not really aware of Altman until The Player (not "Players" as you write). And I have for some reason never seen MASH the movie. I'll remedy that now, thanks. I was just about to add that not many of his films has made all that great an impact on me personally, though an impressive number are quite famous. But now I see he made one of my favorites: Vincent And Theo. Mike, thanks for that excellent mini obit. You speak for me. If he was a writer, I could read his laundry list. since he was a director, I'd watch his home movies. Robert Altman made M&MM in Vancouver, actually West Vancouver, where a set was built on the side of Hollyburn Mountain. A friend at the time did continuity and had a bit part as one of the hookers, you can see her climbing out of the hot tub. I was taking a film class at UBC and Robert Altman came and spoke to the class. It was very special. Nashville,Short Cuts and The Long Goodbye are among my favorite films. What a great mind.His cache among actors was a true testament to his vision and approach.